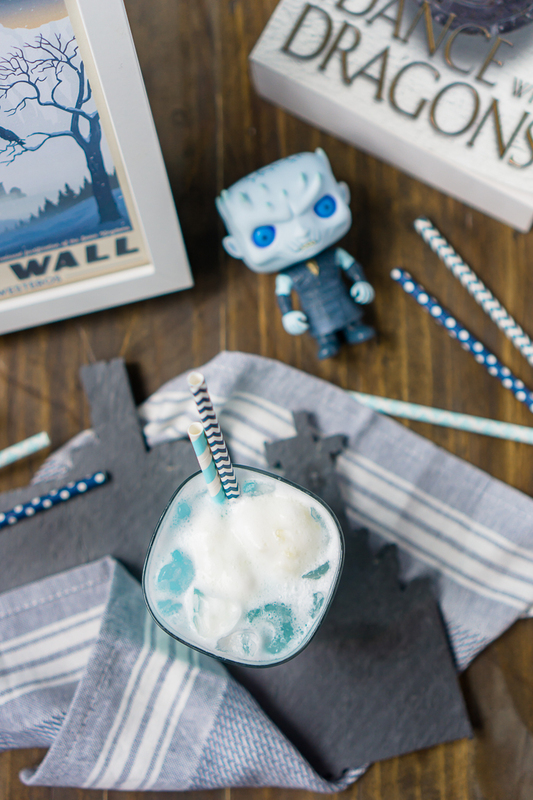 There’s no better way to enjoy a Game of Thrones episode than with a Game of Thrones cocktail recipe like this Ice Dragon Cocktail! I mean, with all the intensity going on, how could we not need a drink? The Ice Dragon Cometh which means it’s time for a Game of Thrones Ice Dragon Cocktail Recipe! 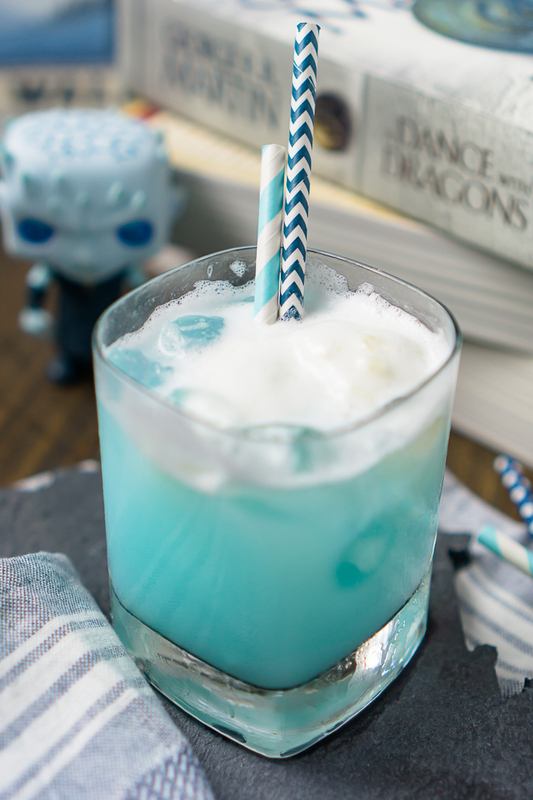 I am back again with one more Game of Thrones Recipe before Season 7 officially comes to a close, and this time it’s an Ice Dragon Cocktail Recipe for the Ice Dragon we have been waiting for! Ice Dragons has been one of the main theories for the show so it was awesome to finally see Viserion come back to life with those bright blue eyes last week! “ICE DRAGON!” Ice Dragon is definitely much scarier in my opinion and definitely ups the stake for the battle with the Night King. I also think this Ice Dragon leads us to the Wall finally coming down because I’m convinced it is coming down tonight! Ice Dragons make an appearance in the novels A Song of Ice and Fire as well; they’re said to roam the Shivering Sea and White Waste. Jon also mentions recalling stories from Old Nan about the ice dragons as a child. While they are also described as much larger in the books with translucent wings which is causing some people to say that, “No, Viserion is NOT an Ice Dragon”, I think we can assume the tv series is taking liberties with the idea of an Ice Dragon and making it far more dramatic to turn one of Dany’s children into an Ice Dragon instead of having a new creature appear from off story. We got the pale crystal blue eyes as described in the series, and I’m sure we will see his freezing breath soon! If you decide you really want to deep dive into the work of George R.R. Martin, he also published a children’s novel back in the 80s called Ice Dragon. While similar in some ways, Martin has refuted that this earlier work is in the same world as GOT. But clearly, Martin cannot stay away from Ice Dragons! 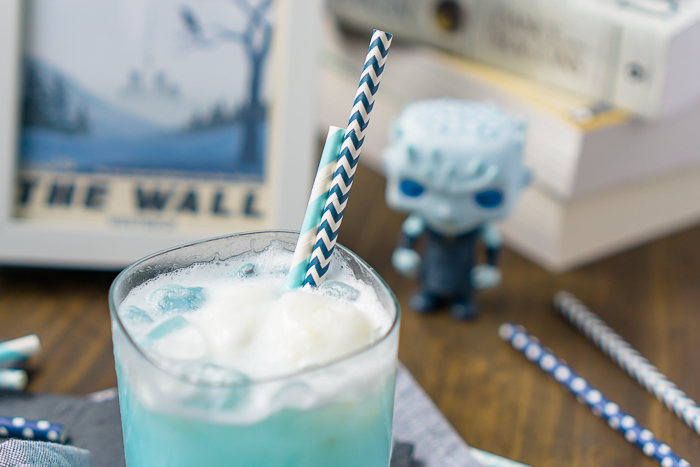 Now, back to our Ice Dragon Cocktail which is my fourth Game of Thrones Recipe! I am not normally one to make too many UV Blue Cocktails, but I think the citrus from the Pineapple Sherbet is the perfect balance for the sweetness of the UV Blue. 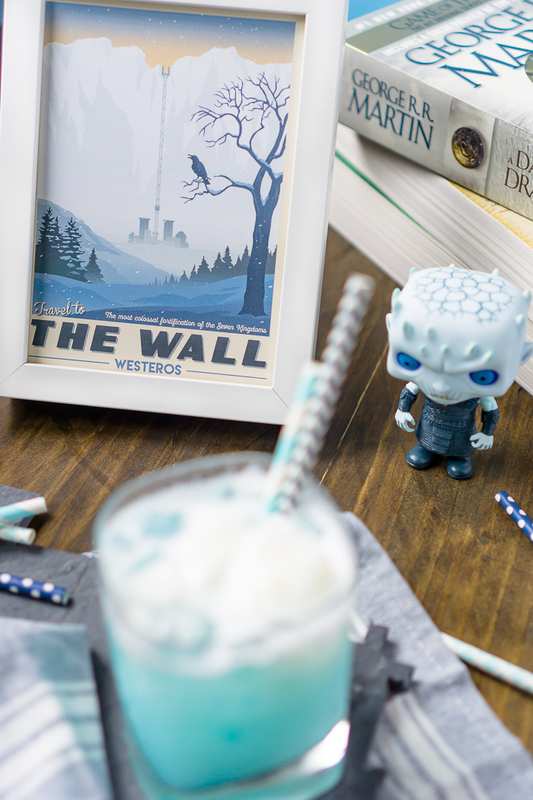 It’s cold, bubbly, and a tasty nod to the blue ice of the Ice Dragon and White Walkers. Don’t forget to check out my other Game of Thrones Recipes, too, or my other Pop Culture Inspired Posts! 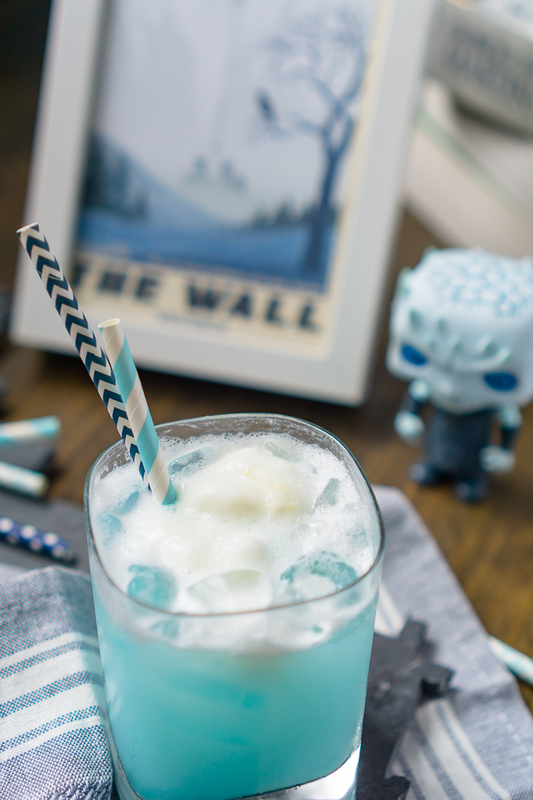 There's no better way to enjoy a Game of Thrones episode than with a Game of Thrones cocktail recipe like this Ice Dragon Cocktail! Fill a rocks glass halfway with ice. Add a scoop of pineapple sherbet, then fill in empty area with a little more ice. Top the glass off with lemon-lime soda. Use a drink stirrer or knife to gently stir.